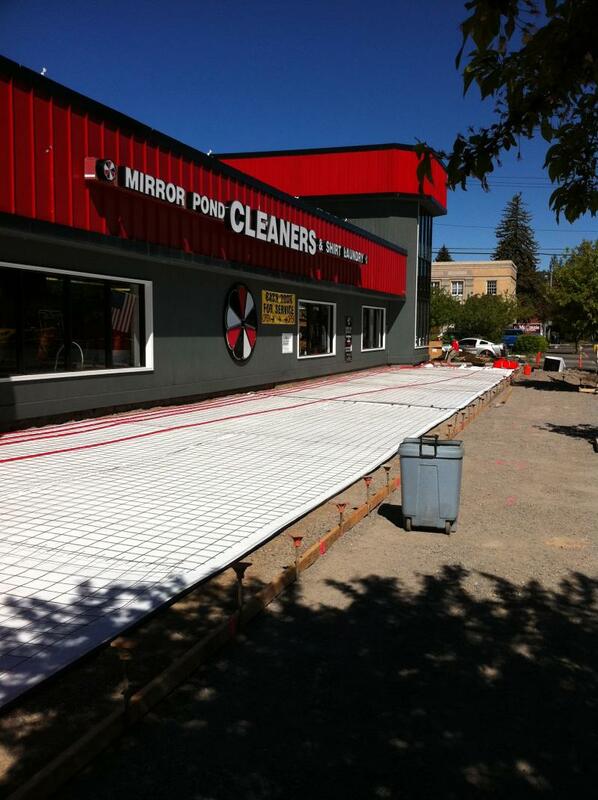 A snowmelt system is a common application in Central Oregon. Snowmelt systems are used to remove snow and ice via embedded hydronic tubing. Common areas for snowmelt systems are: driveways, walkways, parking areas, stairways, loading docks, and around car washes. Everybody knows that it snows in Central Oregon. But more frequently the larger concern for safety in our area is ice build-up. We usually have extended days of below freezing temperatures especially following a snow flurry or snow storm. As high pressure rebuilds and skies begin to clear, the temperatures plummet. Any moisture on the ground freezes and must be removed by shoveling, chemical application or the passing of time. 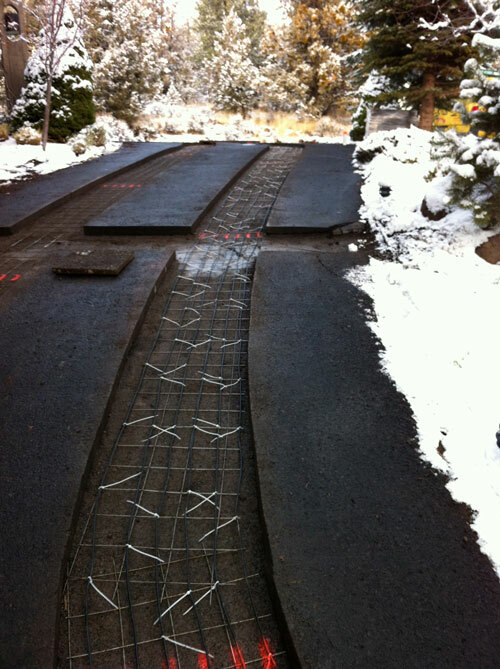 Any roadway, bridge and walkway made out of any material can be snow melted. These systems actually extend the life of the surfaces they heat. Areas that are not heated may heave while freezing and damage to the unheated sections can occur. Three levels (energy requirements) of snowmelt design for Central Oregon provide a starting point of discussion for your project. However, a sit down discussion to determine what you expect your system to accomplish is critical. For most residential and light commercial applications all we need is for the slab to reach 36-37 degrees. This design will handle 1-2 inches of snowfall per hour. For energy efficiency, the control should measure slab temperature, outdoor (northside) temperature and detection of moisture on the slab sensor. When a snow/ice incident occurs and the boiler receives a call for heat, the control will adjust delivery temperatures based on those factors already mentioned. As the "target" temperature is approached, the boiler and delivery system will ramp down the supply temperatures so as to use less energy. These snowmelt control products have proven reliable and they reduce operating costs. A manual turn-on and turn-off system control is not recommended. For this residential driveway, we cut into the existing asphalt to embed the electric cables. For commercial properties, a snowmelt system can solve winter safety concerns as well as increase the longevity of newly placed concrete.